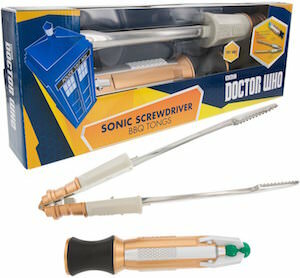 A new Doctor Who means new tools too and that is why you need to check out this 13th Doctor Sonic Screwdriver. The Sonic Screwdriver that will be used by the first female Doctor looks to me like a robot finger only this finger is almost 8 inches tall and has light and sound build in to be just like the real Sonic Screwdriver only without the special powers it brings to Doctor Who. A Sonic Screwdriver as used by the 13th Doctor is great to own as part of your collection or as part of you cosplay or Halloween costume. If you are a Doctor Who fan in need of a Sonic Screwdriver then you should check out this 12th Doctor Sonic Screwdriver Key Chain. 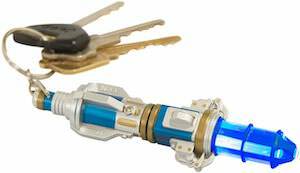 As said it is a Doctor Who key chain that is great to for holding your house key or maybe the key from the Tardis and then there is a Sonic Screwdriver on it or at least a smaller version of it. The 5.5 inch long Sonic Screwdriver is the same one that the 12th Doctor used after he switched from the same one the 11th Doctor used. And this Sonic Screwdriver has two colored LED lights build in it so that you can even use it as a flashlight. Now you can show your Doctor Who love on your wrist because there is a Doctor Who infinite love bracelet. The bracelet is 6.5 inches long and comes with a two inch extender to make it fit perfectly. 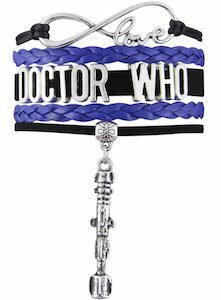 The bracelet has many layers wit hon the top a black cord with on it an infinite loop with the word love in it and then there is a blue band with below it the words “Doctor Who” and then another blue band and then on a black cord you will find a dangling Sonic Screwdriver. This is just the fun Doctor Who jewelry as it will look stunning on you. Christmas need some Doctor Who to it and thanks to this ornament set you will be all up to date. The ornament set includes two Doctor Who Christmas ornament that includes the 12th Doctor that is holding a nice Christmas present in his hands and the other ornament is the 12th Doctor’s Sonic Screwdriver so that you have the coolest ornaments that are all like we have seen in his last season. Besides your Christmas tree these ornament will be cool in other parts of you home too as you could hang them anywhere as there are nice strings on it. This Christmas can be spent in front of the TV thanks to the Doctor Who The Christmas Specials Gift Set. 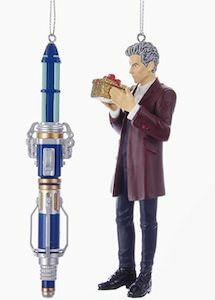 The gift set comes in a DVD or Blu-Ray version and includes 11 Christmas specials and that means almost all of them and to make this an even better Christmas gift they even added a Sonic Screwdriver and it is the one used by the 11th and 12th Doctor. 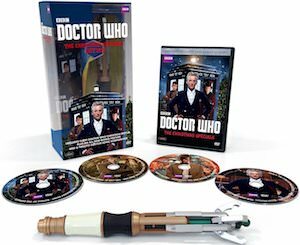 And to make this set even more special they even added a special bonus feature so that even if you have seen all the Doctor Who Christmas episodes you will find something new. 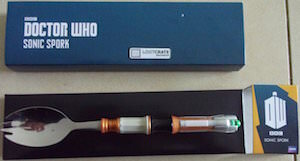 If you are a Doctor Who fan that likes eating then this Sonic Screwdriver spork is what you need. A spork is a spoon and a fork in one and that also means you will have less dishes to wash. The Doctor Who spork has a handle that looks like the Sonic Screwdriver used by the 11th and 12th Doctor’s and that of course makes it even better. Now you can eat cereal in the morning and any other meal during the day while dreaming away to a Doctor Who adventure. Now you can have the Sonic Screwdriver used by the 12th Doctor. Sure the Doctor first stared using the Sonic Screwdriver from the 11th Doctor and after that the sonic sunglasses but now he has a fancy Sonic Screwdriver that you just need to own. This replica of the Doctor Who Sonic Screwdriver has build in sound and light and besides blue there is green light in there to because you may need a different sonic program to do what you want with it. It’s a great cool item that can’t be missing in a Doctor Who collection and also works great as part of you Doctor Who cosplay or Halloween costume. As a true Doctor Who fan you know all about the Sonic Screwdriver used by the Doctor and this kit lets you build you own Sonic Screwdriver. 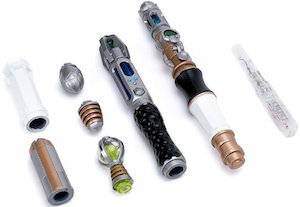 The set includes many parts that together become a working Sonic Screwdriver, it has lights and sound but no true power. And if you want you can build the 11th Doctor’s Sonic Screwdriver but if you are smart you can even build two Sonic Screwdriver out of this kit and that of course makes it extra fun. This Sonic Screwdriver toy is more for the older kids and adults as it has many smaller parts. If you like to grill in the yard then now you can do it in Doctor Who style by simply using this BBQ Thongs that look like the Sonic Screwdriver used by the Doctor. The BBQ thongs look like the 11th Doctor’s Sonic Screwdriver and the thongs when not in use are stored inside the top of the Sonic Screwdriver so that it all looks like a giant Sonic Screwdriver. Just imagine having a party and you are cooking those burgers holding the Sonic Screwdriver to cook them. 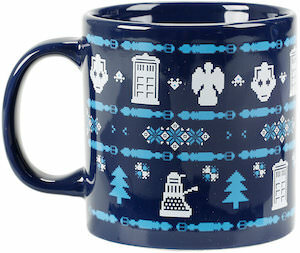 All the Whovian’s at your party are going to love it and I am sure you will to.